Putting up a fence isn’t as simple as buying the materials or hiring a company. Read these tips first. Up, up and away! This might be one of the many phrases that run through your head if you’ve ever seen your dog leap right over a fence. The truth is, a lot of dogs jump or climb over fences. When they’re determined to get to something on the other side, you need to be just as determined to stop them. So before you go out and buy a fence, consider the following. Research your town’s by-laws and regulations, which you can usually find at the town hall. Although local fencing companies should be aware of these regulations, the temptation may be too much for some of them. Consider the breed and temperament of your dog. Clearly, a Chihuahua will not need as much room as a Great Dane or a Golden Retriever, but the temperament plays a large part in your decision as well. You may want to fence in your entire yard to provide as much play area as possible for your dog. Or you may want to create an enclosure where your dog can roam freely but that is smaller than your yard. Provide an area that is at least 10 feet wide so your dog doesn’t feel closed in. Think about how big your dog will get. A small puppy won’t need a high fence — but if the breed is a mastiff, he will grow large and tall. Build the fence based on the needs of your dog over his lifetime so you won’t have to replace it when your dog is fully grown. Chain-link: This is cheaper than wooden privacy fencing and is durable. Downside: It allows dogs to see through to any triggers that might set off their aggression or excitement. And it’s not impossible for dogs to get over chain-link fencing. 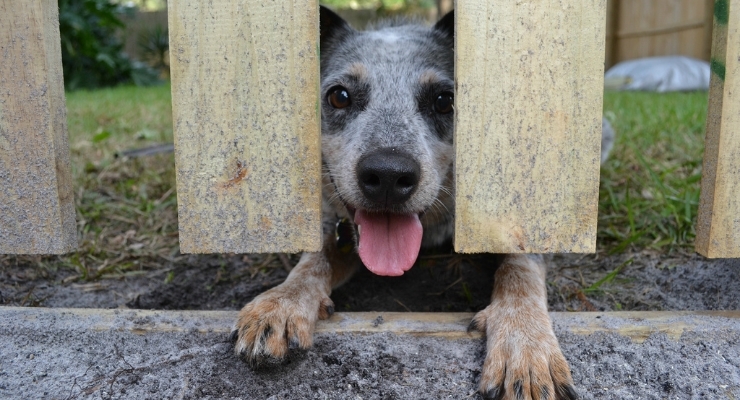 Wooden privacy fencing: This blocks outside visual stimulation for your dog. It usually lasts about 15 years, depending on climate and abuse. Downside: Determined dogs can push or wear pickets so that they fall off. They can also use the middle support bar as a launching pad. Make sure the support bars face away from your yard. Vinyl fences: These are more durable than their wooden counterparts and provide more security. Choose solid panels to block the sight line of your dog. Downside: They usually cost more than their wooden counterparts. Split-rail: You can buy fabrics to stretch on the inside to create a barrier for your dog. Downside: Split-rail fencing is usually not tall enough to keep a determined pet contained. Concrete and/or masonry walls: These are strong, can be built to order in terms of height and design, and have no gaps. Downside: They are expensive to install. Wireless fences: These systems mark the borders of your property and deliver an electronic shock to a pet who crosses the border, via a special collar. Downside: Your dog may see the mailman and give chase, paying little heed to the brief jolt of pain. When the adrenaline rush is over, he may not want to cross back into the yard because he knows a shock is coming. In addition, this type of fencing does not prohibit other people or pets from coming into your yard. First, find out how he’s getting out. Is he a digger or a leaper? Diggers can be thwarted by making the bottom of the fence uncomfortable to stand on. Some folks line the ground with chain-link fencing. You can also stop a digger by digging down yourself and installing chicken wire so that when he digs down, he is frustrated by the barrier. Leapers can be stopped by installing a variety of barriers at the top of the fence. You can use the ever-handy chicken wire, for example. Take it and staple it to the top of your fence with a staple gun, then bend it back toward you. When your dog leaps, she’ll bounce off the inside of the wire as it will be looped over her head. The best way to stop escape artists is with active parenting. Be outside with your dog and pay attention so you can stop this behavior right in the moment. Many dogs who look to escape need stimulation, so provide it in the form of play. Distract your pup from that fence and all that is going on outside of it. For diggers, you can even provide a sandbox for them to dig in and reward them when they dig there, while discouraging digging elsewhere.